I bring you another outfit post, for an outfit that I am obsessed with, featuring fringe and another statement necklace. I had a rather rough week last week, I wasn’t feeling so great and I had a recurring headache that evolved into a migraine, so that was fun. Not sure if it was due to stress, allergies, a combination of over working, being tired, stress, environment/pollen??? But I am feeling much better after relaxing this weekend and my paper was officially accepted to the journal! So I was super happy and I treated myself to a manicure, lunch, and drinks on Friday. Laughter really helped alleviate my headaches, and being surrounded by good people really helped! I love this outfit because it is rather simple and proper to wear to lab, yet still edgy enough to have some style! I bought this fringe top and statement metal necklace from Express, and I fell in love with how it all looks together! Paired with my usual dark Zara jeans (which, I have to go shopping to get new pants, too much wear has caused some holes… anyone else have this problem?! 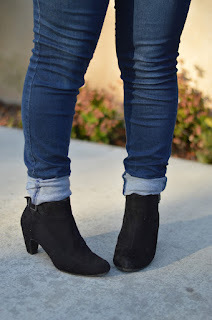 ), some low heeled booties from Sam&Libby at Target, along with some accent bangles (cute Tassel bracelets from Charlotte Russe), I loved this outfit! I picked up the pant cuffing technique from my friend Megan, who did it to wear with cute ankle booties, and I loved it. Seeing as I have short legs, my pants are always too long, and I end up with so much extra fabric towards my shoes. I was turning it inwards so it was hidden but bulky, but cuffing them outward was such a cute touch! These ankle booties were also super comfy to walk around in lab all day doing experiments! And being a Friday, SO easy to transition out to happy hour with friends and later dinner! I have to ask, do you have some tips for pants shopping? I hate going shopping for jeans, mainly because I don’t have a set brand of jeans I love (I used to LOVE American Eagle jeans but I kind of outgrew them, and they changed up the styles). Do you have a pair of jeans that you are in love with? Any brand suggestions? I need to go shopping this week for new pants because a lot of my pants that I have have developed holes in the inner thighs (curvy girl/short girl problems?!). I always have a hard time because of 1. the length, 2. the bum area, and 3. the hips to thigh ratio (fits in the thighs, too tight on the hips or the other way around!). Any suggestions are super welcome! 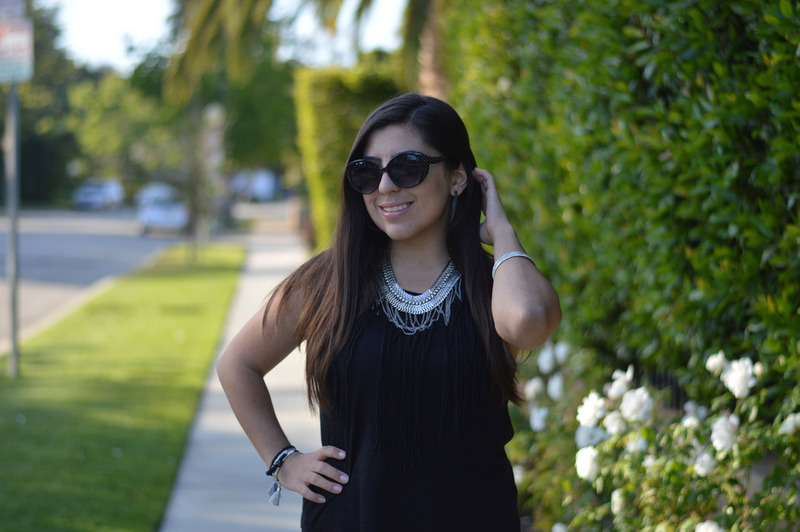 Well anyway, I have been meaning to post this outfit for a while now, I just love the combination of Fringe and Metal Statement necklace (if you have been following my blog lately you know how much I have been talking about fringe and statement necklaces!). Do let me know your suggestions and comments about this outfit below! PS. My Anjolee Necklace Giveaway is still going on, it ends in exactly a week from now, next Monday the 25th, so go over and enter!! Click Here for Giveaway! 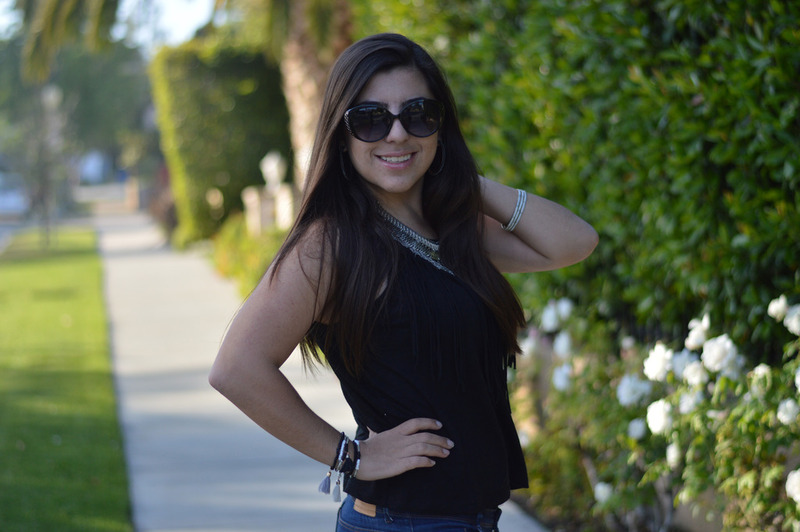 Previous Post Fringe Kimono and Amethyst Gemstone Necklace – Anjolee Necklace Giveaway! Great outfit with awesome details. Thanks for sharing. You look lovely, beautiful as usual! 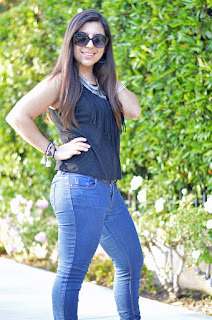 I loved the top and the jeans, as well as the booties and the necklace! I am glad that you are feeling better now! Migraine is really terrible, it paralyzes us, really. I think it was a combination of everything you mentioned! The best is to try to avoid stress, but how can we do it! I also dislike buying jeans and the holes? Same problem! I like Asos jeans very much! Hope you like the suggestion and that you have a very nice day! I'm glad you're feeling better. I know how you felt because I was feeling the same way. When you feel like that it's important to step back and do some things that relaxing. That fringe and silver are so pretty together. It's so hard shopping for pants, let alone jeans. I hope you find a brand you love. 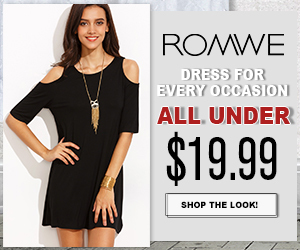 Loving this understated yet edgy look! 🙂 I haven't had any issues with my Zara jeans tearing yet, but I do love their jeggings and, for a more expensive, quality jean, I always reach for my J Brand Mid-Rise Super Skinny jeans. Can't wait to see new looks and posts soon!